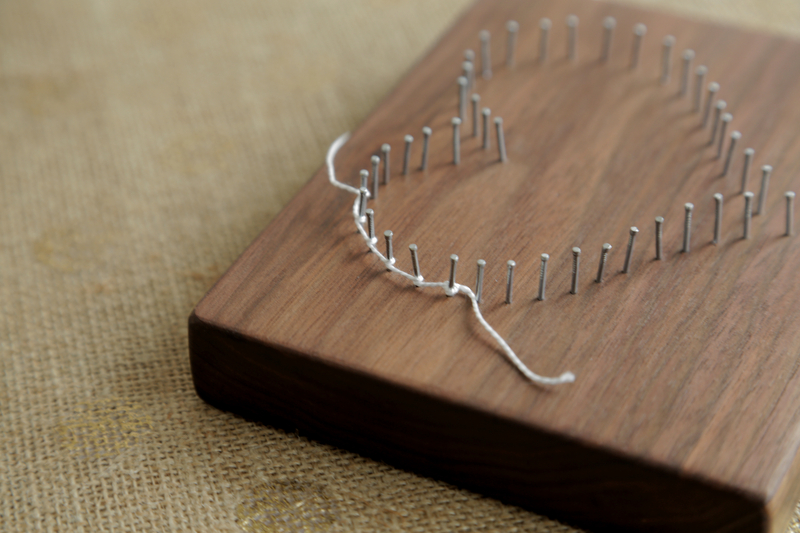 Several months ago, I made one of my girlfriends this string art heart for her new baby’s nursery. I loved it so much that I made another to keep for myself. It’s beyond easy to make and the stringing part is really therapeutic, you just wrap every which way until you like what you see. Want to make one for yourself? 1. 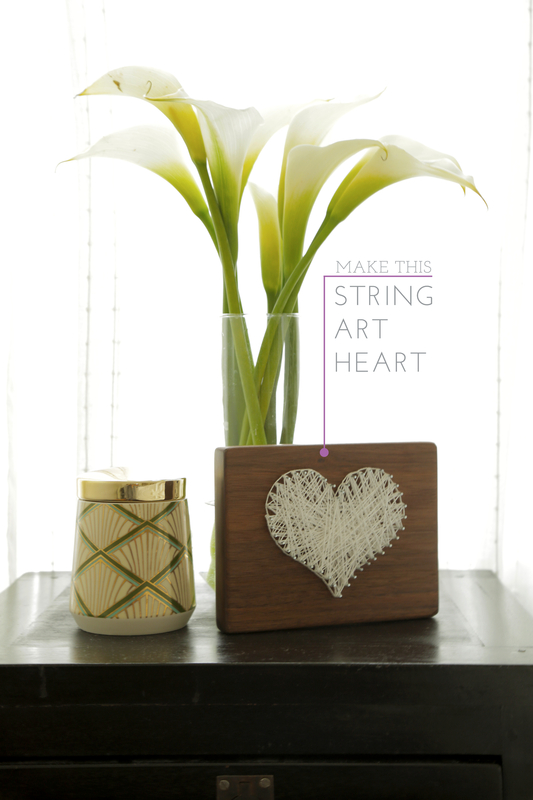 Start with a wood block that’s about 5″x8″ (I cut my own, but Michaels’s has great wood pieces to choose from). 2. 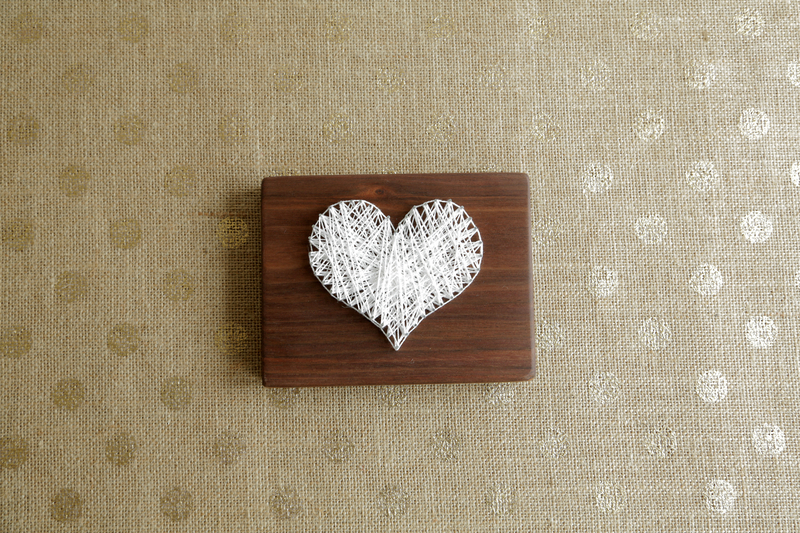 Draw or print a heart on a sheet of paper and tape it down on the wood block. 3. Nail down small tack nails about 1/4″ apart, around the perimeter of the heart. 4. Once all of the nails are down, tear away the paper. 5. Tie a small knot on one nail and start stringing by looping around each nail. 6. Finish stringing across the heart in every direction, the more varied the better. Tie off your loose end once your finished. Add hanging hardware to the back if you’d like and voila! I love this! Want to make one for my friend getting married soon now! Thanks for sharing. I’ve been wanting to try string art! You make it look so easy. I always forget sometimes the simple ideas are the most beautiful. Great idea! What a lovely idea. I will definitely be trying this – it’s so effective! where do you find a wood block? Hi there!! My hubs cut this down for me but you can easily find wood plaques at Michael’s or any craft store. Maybe even at Home Depot or lowes too!! I’m not quite sure if they have a specific name, but they’re thin, short? With a small head. I bought them in the bulk nail bins at Home Depot. They weren’t special in any way, all nails can work. What type of nails did you use and how long were they? Do you kno about how much string you used? Poate cea mai simplă și mai de efect artă – string art – Ana are blog.